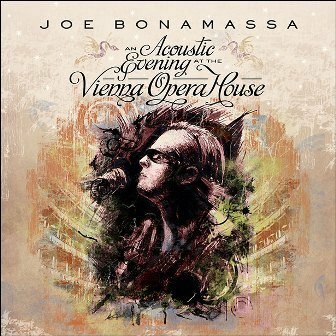 Joe Bonamassa to release "An Acoustic Evening at the Vienna Opera House"
“Joe Bonamassa - An Acoustic Evening at the Vienna Opera House” will be released in the U.K. on 2-CD, 2-LP, 2-DVD & Blu-ray formats by Provogue Records on Monday 25th March (followed by U.S. release on Tuesday 26th March). The release dovetails Bonamassa’s run of four exclusive London concerts which kicks off on March 26th at The Borderline. The concert was recorded at the historic Vienna Opera House in July 2012 during a very special unplugged tour, played to a limited audience over seven exclusive European shows. Varying from Bonamassa’s predominantly electric blues shows, this presentation was an all-acoustic concert performance, making it a unique and very special show fans had been waiting years to experience. The Opera House in Vienna, regarded as the “City of Music,” was chosen for the main event because of its history and splendour, and association with many legendary composers. Accompanying Bonamassa on stage are traditional Irish fiddler Gerry O’Connor, who also plays mandolin and banjo; Swedish multi-instrumentalist Mats Wester on the nyckelharpa, a keyed fiddle; Los Angeles-based keyboardist Arlan Schierbaum texturing the mix with celeste, accordions, toy pianos, and assorted “organic” instruments; and renowned Puerto Rican percussionist Lenny Castro. An Acoustic Evening at the Vienna Opera House features gorgeously textured music made with a wealth of rare, vintage, organic, and “oddball” instruments. Highlights among the 22 songs include Woke Up Dreaming —the one acoustic song, and fan favourite, that Bonamassa regularly plays during his electric shows, as well as Around The Bend, Driving Towards The Daylight, and Sloe Gin.